FOR MORE THAN A DECADE now, consumers of apples purchased at grocery stores have had to peel off a small oval label from their fruit. Originally developed to accommodate scanning technology at the cash register, the labels now include information that allow the fruit to be traced to its origin with great accuracy. This increased accountability provides consumers with an extra measure of security as they bite into their favorite apple. Price Lookup Codes (PLUs) became standard in 1995. The four-digit number allowed scanners to tell whether the item was an apple or an orange, for example, or a McIntosh or a Cortland. Words were optional, and sometimes the variety or the brand was added. Three years ago a new data bar label was developed with food safety in mind. 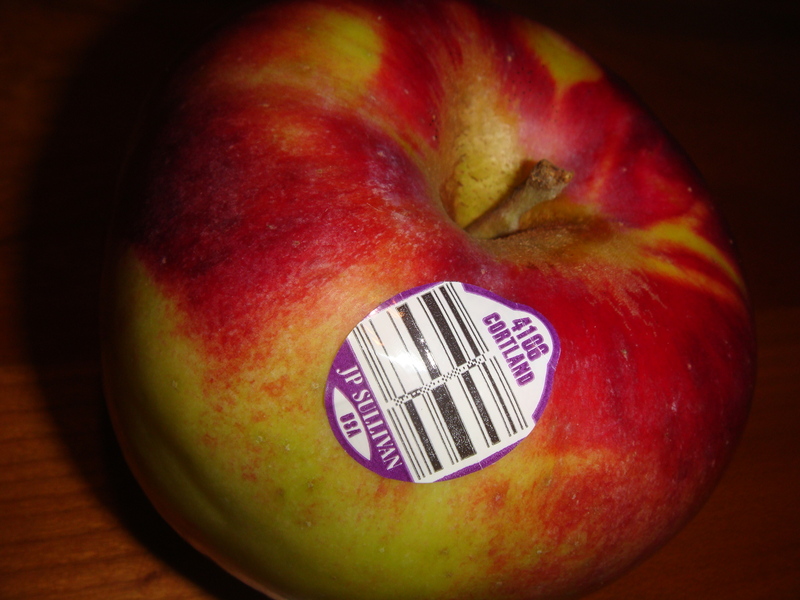 Now the labels include a unique number for every supplier, so in the event that a food safety issue arises, the fruit can be traced back to the firm that supplied it. The carton in which the apples were packed and shipped contains even more information, including the day it was packed. This is all part of the apple industry’s efforts to ensure that the fruit you buy is safe, as are the emerging rules on Good Agricultural Practices, or GAP. GAP’s primary objectives — economic viability, environmental sustainability, social acceptability, and food safety and quality — are included in most private and public sector standards, according to the Food and Agricultural Organization of the United Nations, but their scope varies widely. Grocery chains for several years now have required produce suppliers to conform to GAP standards, leading to a number of changes at orchards and packing houses, from different handling procedures to new bathroom facilities. J. P. Sullivan and Co. in Ayer, Massachusetts, New England’s largest packing facility, built an addition to its packing house for employees to meet, eat, and store their personal items, with a separate entrance and new bathrooms. Other growers have made similar improvements to their operations. The problem growers face, however, is that currently there are no universally accepted GAP standards. Every produce buyer can develop its own standards, which can make compliance a major expense and bureaucratic nightmare. It makes inspections particularly burdensome, as growers must sometimes pay for multiple inspections because of the differing criteria. cry the children with one voice. wrap it up and count me twice! WHO WOULD HAVE GUESSED a 1950 cookbook priced at $3.50 would hold a luscious recipe for apple dumplings? Maybe the more apt question is why was I even reading it – nutrition, nursery rhymes, or nostalgia? We can quickly omit nutrition; most of the recipes of that era need to be modified with a heavy hand to even be admitted into my kitchen. Being a new grandmother, it’s very possible I was taken by the little poem accompanying it, but more likely it’s nostalgia. No, not nostalgia for decades past, but for the Big E! Being a relative newcomer to the fair (only two years under my belt), I’m struck by the number of people who head straight for our New England Apples booth in the Massachusetts State Building and frown at the menu looking for the apple dumplings. They were removed from the menu the year I began, and for a good reason: the previous booth manager warned me they require too much baking and checking time, something there is never enough of when the line of customers is growing. That is never an issue in my little house, so I’m happy I found this fairly uncomplicated, old-fashioned, delicious apple dumpling recipe to share with any of our disappointed Big E customers. The amount of pastry crust for a two-crust 9” pie will yield enough for 6 dumplings. Roll out pastry 1/8” thick and cut into 7” squares. Fold up opposite corners of pastry around the apple, covering cavity completely; overlap, moisten to seal edges. Carefully lift dumplings into a baking dish. Pour hot syrup in bottom of baking dish, around – not on – the dumplings. Dot each apple with 1 T butter. Bake in 425° oven until crust is flaky and brown and apples test done (a fork slides in easily). Baking time will vary with the apple variety, but about 40-45 minutes is average. Serve warm with the syrup or whipped cream. Can’t wait for a sample! Sounds delicious . . . I understand that the first number on the PLU gives an indication of the whether the product is organic (PLU starts with 9) or genetically modified (PLU starts with an 8) I dont know what numbers 1 – 7 are indicating.